Imagine you are a radically generous philanthropist. Each year you wield the power to donate hundreds of thousands of dollars to improving the lives of people around the world. But what nonprofits do you choose to support? How do you determine which organizations will steward your funds well? Charitable giving accounts for approximately 2% of the United States’ GDP each year. According to the National Center for Charitable Statistics, 72% ($228.9 billion) of that pie originates from individual donors. While not everyone can be Warren Buffet, we all want to see our charitable donations effecting tangible changes in the causes we support. Whether you’re donating $1 or $1,000,000 you want to be assured good governance. Overhead refers to the operational costs an organization spends on administration and fundraising. It’s the proportion of funds not directly invested into programs aimed at helping the needy. This includes office space, employee salaries, benefits, transportation, staff training, information technology, management, accounting, human resources, etc. 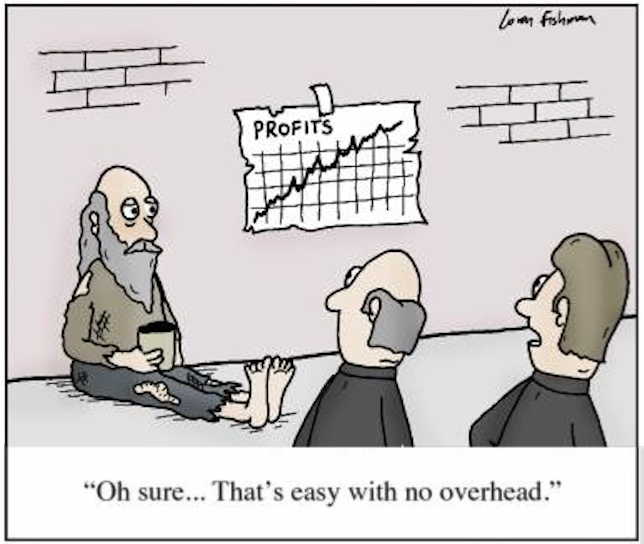 Low overhead costs have become the holy grail for judging how well nonprofits do their work. To some extent, I think we all understand this. Donors would prefer to feed starving children than to fund an organization’s utilities. Low overhead costs can indicate prudence and good judgment. However, they can just as easily indicate inadequate staffing, insufficient salaries and poor impact. Dan Pallotta, an activist and fundraiser, gave a TED Talk to address this issue entitled The Way We Think About Charity Is Dead Wrong. He describes how the belief systems of our society have created two rulebooks: one for the nonprofit sector and one for the rest of the economic world. He describes how the nonprofit sector has been discriminated against and prohibited to compete with the for-profit-sector in five major areas: compensation, advertising and marketing, innovation, time and profit. In the nonprofit sector we have latched onto low administrative and fundraising costs as the measure of excellence. But what other businesses measure their effectiveness by these ludicrous metrics? Does Apple or Google or Amazon? In fact, Amazon spent the first 6 years without returning a single profit to its investors. Shareholders were patient because they understood the long game; the upfront cost in time and money to build market value and scale. Now imagine if a nonprofit used the same approach. They had a dream to build scale that required 6-years of investment where no money would actually go to the needy. In the nonprofit world this would be a death sentence. So what should be the benchmark to determining the value of a nonprofit? Many donors rely on rating systems such as Charity Navigator and the American Institute of Philanthropy to provide meaningful guidance. Unfortunately, many of these systems emphasize overhead while ignoring questions of program effectiveness. They also do a poor job of qualitatively analyzing areas such as management strength. Rating systems are valuable for providing rapid, simplified information to donors to support informed decision-making. However, rating organizations need to begin address the question of social impact. As donors this is something we ought to demand. Thanks to Global Health Corps.